Enter another world at Sea Acres Rainforest Centre, a place of natural serenity, protecting rare subtropical rainforest in Sea Acres National Park at Shelly Beach, Port Macquarie 5 km from Port Macquarie town centre. Be inspired by the sights and sounds of the rainforest on a stroll along the elevated 1.3km accessible boardwalk (suitable for strollers and accompanied wheelchair access). Take a tour with the award winning Volunteer Rainforest Discovery Guides (complementary with entry fee) or enjoy the walk at your own pace with self guiding information. Browse the gift shop selling a range of unique gift and homeware, souvenirs, educational toys. Immerse yourself in the peace of nature at our monthly Yoga in the Rainforest guided meditation walks - first Saturday of the month, or take an Aboriginal Discovery tour. Bookings essential. Enjoy delicious lunch, morning and afternoon teas in the Rainforest Café. 6582 4444 (9am to 4pm). 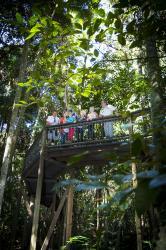 Sea Acres Rainforest Boardwalk entry fee: $8 Adults; $4 school age children: $16 family; $7 Seniors Card holders. Open 7 days excluding Xmas day and Triathlon events- 6582 3355.